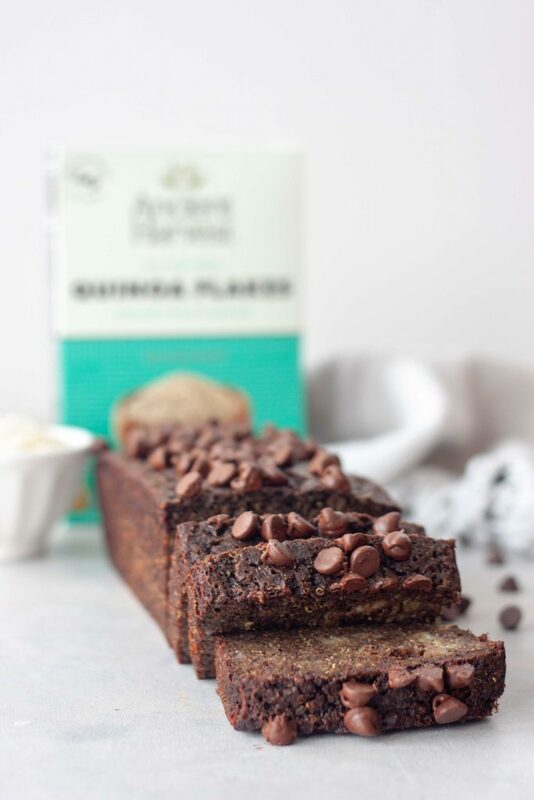 This Life Changing Chocolate Banana Bread recipe is sponsored by my friends at Ancient Harvest. As always all opinions and thoughts are my own and I only post about brands I buy and my family loves. 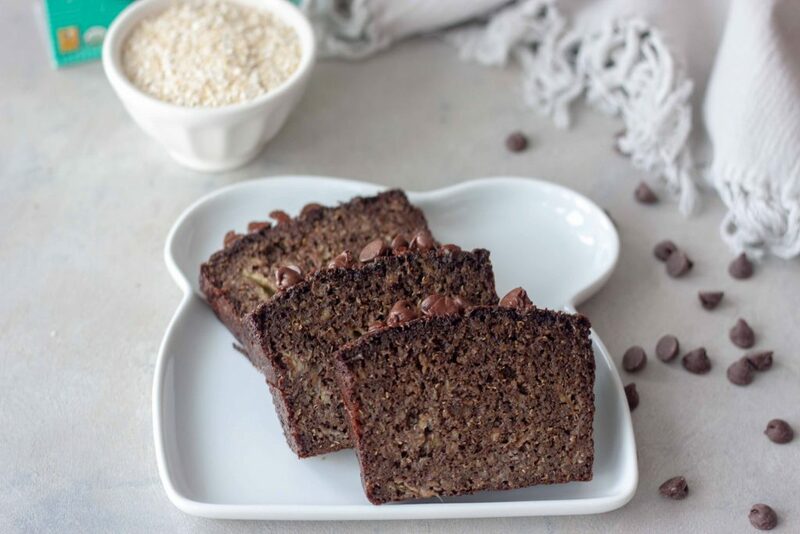 Since Valentine’s Day is this week it’s a perfect time to share my most loved recipe lately Life Changing Chocolate Banana Bread which just happens to include chocolate, oh and bananas which if you’ve been following me on Instagram you already know it’s one of my biggest cravings right now. I cannot tell you how many loaves of banana bread I’ve made in the last month and how many more I have stashed in the freezer for when baby boy arrives. Let’s just say I sent my husband to the store last week and asked him to pick me up “a few” bunches of bananas and couple cartons of eggs. 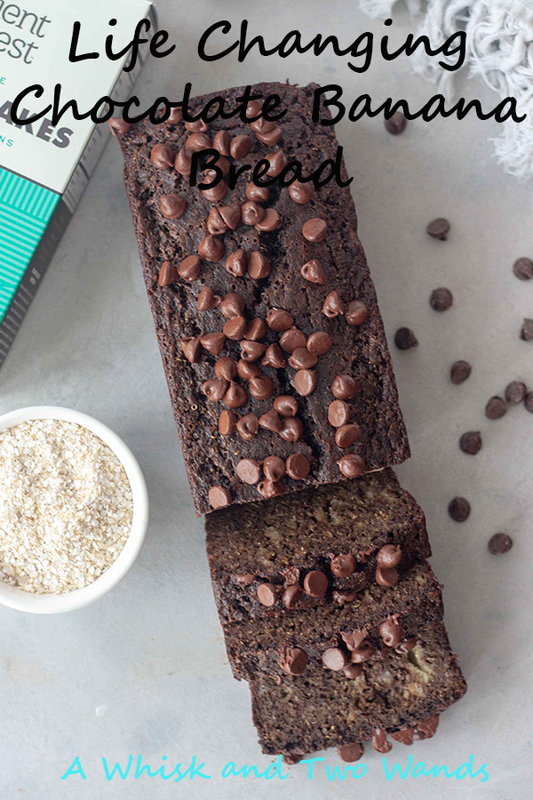 This Life Changing Chocolate Banana Bread is a favorite and on repeat, which is why we went with the name we did (the family helped, Yummy Yum Yum Chocolate Banana Bread was another suggestion that I thought was cute). My craving for bananas, along with a few other fruits, has been off the charts, especially in the 3rd trimester. While I’ve always loved banana bread, there is something so comforting about classic banana bread that brings back memories of my grandmothers and always hits the spot, I haven’t made it nearly this much in recent years. I also would eat caramelized bananas but raw bananas weren’t a staple but now I will revert to childhood days of bowls of bananas and milk, sometimes a little cereal. My favorite is homemade cashew milk. Even simple basic bowls of oatmeal with bananas hit the spot! Even better warm cozy bowls of cooked quinoa flakes instead of oats. Never had quinoa flakes? Stay tuned because this is something you’ll want to know and try! As I’ve mentioned since getting pregnant my diet has changed a lot. There are a lot of things I love that I haven’t been able to eat and a lot of things I haven’t eaten in years that I’ve added back into my daily life. Favorites like avocado, coconut, lots of veggies, and even coffee haven’t agreed for most of the pregnancy. Coffee not at all at first, then was ok, and again not agreeing with me. The hardest thing has been to add in more protein, iron, and a few other key nutrients that my body and baby boy need. Baby boy is clearly sucking certain nutrients from me and I’m trying to respond and listen to my body. I know this because what started as my hair growing like crazy and getting thicker stopped shortly after it started along with my nails. Just knowing he is healthy and doing well despite only having 2 vessels in his umbilical cord make me happy and I know I’m doing something right. We have our next ultrasound at the end of the week, I cannot wait! It’s been all about making simple swaps and mixing things up. First adding eggs into pancakes and baking for protein. While they haven’t agreed with me for a lot of the pregnancy by themselves adding them into things has worked well. They also make this bread incredibly moist. Another simple swap, quinoa flakes! Aside from making this bread taste amazing quinoa flakes are packed with nutrition. 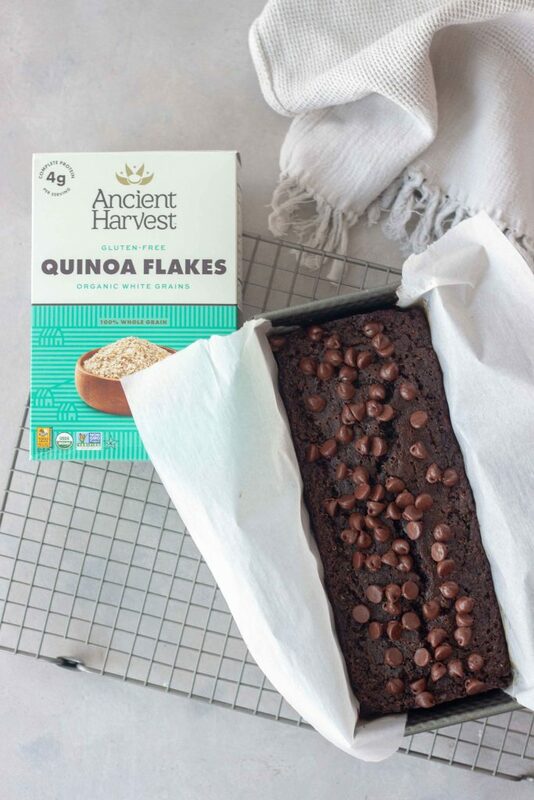 Quinoa flakes are gluten-free, high-protein whole grain that can do everything rolled oats can be sneaked into baked goods and without being detected like oats. While the nutrition content of fiber and protein is comparable to oats the protein in quinoa is a complete protein. This means that it contains all of the essential amino acids the body cannot make on it’s own. While this is found in many forms of animal protein it’s hard to find in plant-based form. Just one of the reasons I was crazy for quinoa and quinoa salads and quinoa was a staple in our house a few years ago, so much so I burnt the family out on it. Ancient Harvest Quinoa Flakes can be used pretty much the same way as rolled oats with some minor adjustments if using for baking. They are thinner, lighter, and smaller than oats so you will have a creamier texture. When making them as you would oatmeal the ratio of water to quinoa flakes is different so a 1:1 swap in baking recipes doesn’t work. 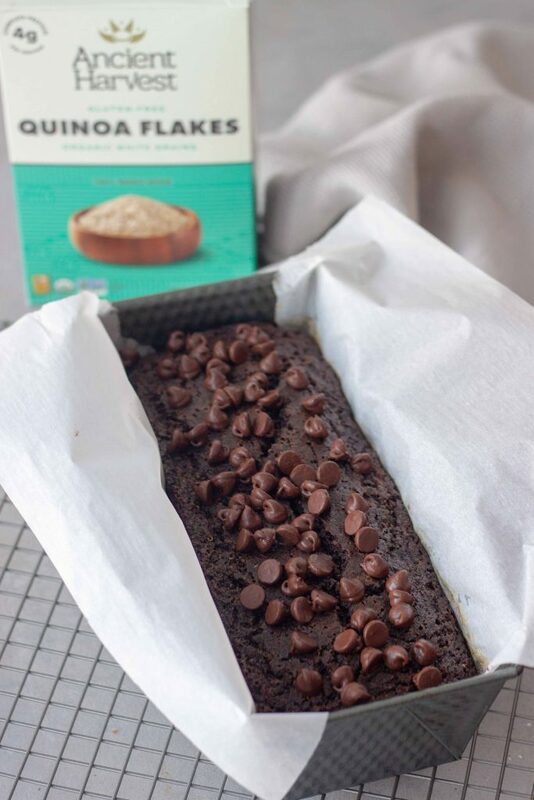 If you had a slice, I dare you to stop at one slice, of this Life Changing Chocolate Banana Bread you would have no clue that there was no flour or oats and that it was made with quinoa flakes. I want to say light but it isn’t light it’s more like a moist pound cake and almost melts in your mouth. 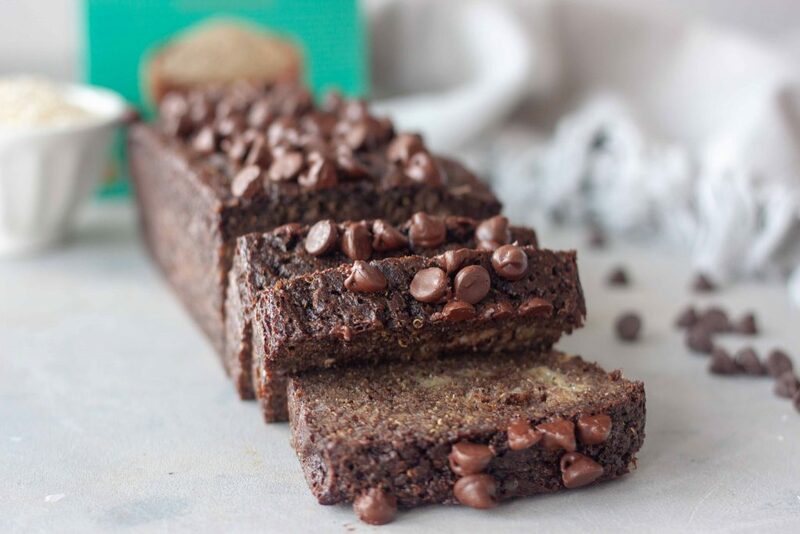 If you’re looking for delicious breakfast, snack, or just guilt free chocolate fix for Valentine’s Day this Life Changing Chocolate Banana Bread is it! Or if you just love banana bread, bananas, and chocolate like I do it’s always a good time to make a loaf. 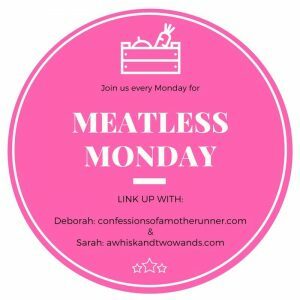 Yep it’s another Monday, Meatless Monday! I hope join my co-host Deborah and I and check out one of the recipes linked up below. We always look forward to seeing all of your exciting recipes and hope you join us. 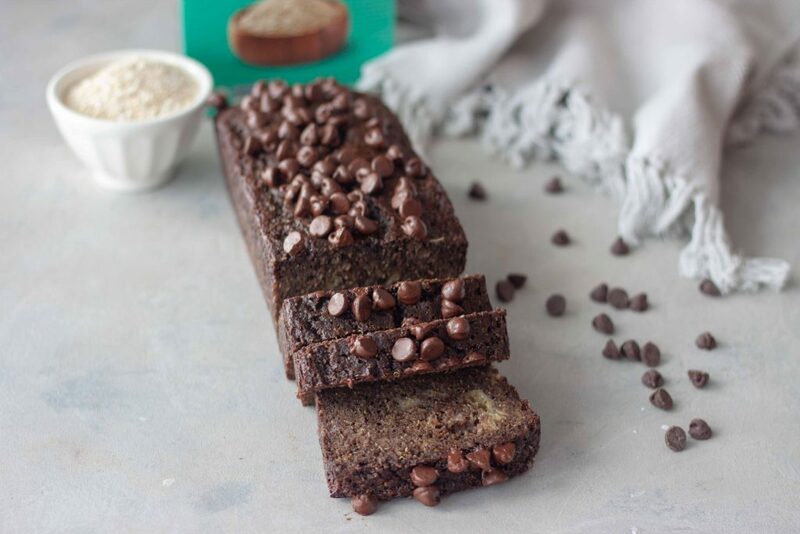 Life Changing Chocolate Banana Bread is gluten free, dairy free, and high in protein! Simply sweet moist banana bread paired with chocolate, it's a real treat you'd never guess is healthy and packed with nutrition! Beat honey, coconut sugar, and oil/butter together until combine. Add in eggs and mix evenly. In another bowl combine quinoa flakes, cacao powder, baking powder, baking soda, and salt. Add the dry ingredients to the wet ingredients until all the ingredients are mixed in well. Mash bananas, you can use the same bowl you used for the dry ingredients. If you like less texture you can blend them smooth in a mini food processor. Stir the bananas into the batter and set aside. Sprinkle the top of the bread with chocolate chips, just pull the rack out don't remove the bread from the oven. Slide back in and continue baking for 20 minutes or until a toothpick comes out clean. Let cool for 10-20 minutes on a wire rack before lifting the parchment paper and removing from the pan to continue cooling. I’ve never used quinoa flakes before. This looks like quite a tasty banana bread! They’re really similar to oats, I hope you give them a try! You’ll have to whip some up for them to try, I think you’ll love it too! This looks so yummy! Chocolate and bananas were made for each other! You can never have to many banana bread recipes. So true, there’s one for every craving and nutritional need! I hope you try this bread! Do you have a favorite way you like to enjoy them? 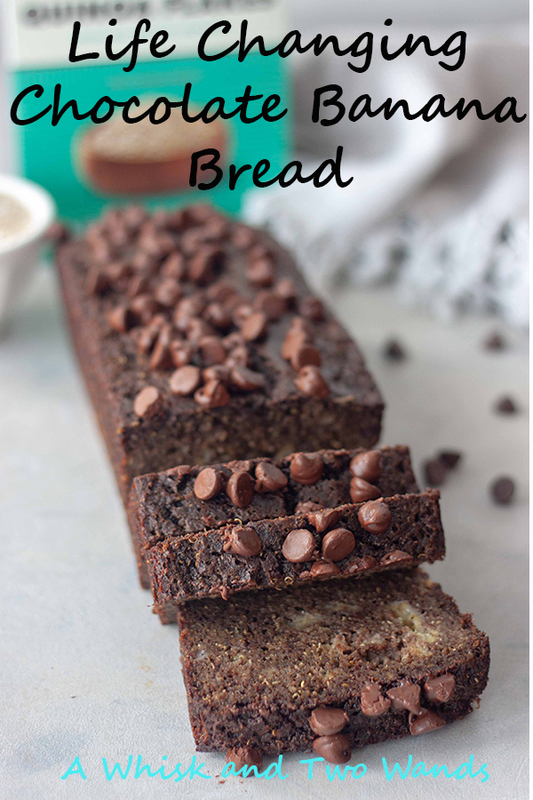 There is nothing as decadent as a slice of deep chocolate banana bread with a cup of coffee for a “me” treat! I’ve never seen quinoa flakes, but I’ll be looking for them now. Yes, such a perfect pair! I hope you love them as much as I do, let me know if you have any questions. Very intrigued with quinoa flakes! Looks I have no choice but to change my life and make this bread – looks DELISH! No way! Do my eyes deceive me – just quinoa flakes and no other grains, nuts, etc? It looks SO tender too. This does look life-changing, can’t wait to try!! This looks so delicious! Wish I had a slice right now!